Fredericksburg City Hall is located at 715 Princess Anne Street, Fredericksburg, VA 22404; phone: 540-372-1010. Though not established until 1728, the area that is today Fredericksburg saw its first European settlers as early as 1671. Fredericksburg's identity and character are directly related to its rich history. The City has found that preserving and enhancing the community's defining historic resources encourages economic growth, promotes neighborhood stability and enhances cultural activity. Adopted public policy fully acknowledges that historic preservation, as a land use, has value. In 1728, the Virginia House of Burgesses established Fredericksburg at the falls of the Rappahannock River to meet the needs of settlers and entrepreneurs moving into the Virginia Piedmont. At this location on a navigable river, the City grew and prospered. Sailing vessels carried manufactured goods upriver to the docks and wharves of the burgeoning town and returned downstream laden with the generous harvests and raw materials of the New World. Of particular interest to Britain was the export of smelted iron, from Governor Alexander Spotswood's furnace. The availability of iron brought Fredericksburg to prominence during the American War for Independence. Local gun manufactories produced muskets, bayonets, and other equipment for many of the Virginia regiments in George Washington's army. In addition, Fredericksburg served as the site of an important potash factory, several mills, hospitals, training centers, and even a prisoner of war camp for some of the British soldiers captured at Yorktown. During the post-revolutionary period, the new nation's focus shifted westward. Fredericksburg embarked on a canal building venture up the Rappahannock River, but new transportation technology hindered its profitability. By the mid-nineteenth century, developing railroads had drawn much of the overland trade from the area west of Fredericksburg to the maritime ports of Richmond and Alexandria. In addition, deeper draught vessels proved unable to navigate the Rappahannock River as far upriver as earlier trading vessels had, causing a further decline in the City's commerce. Despite these difficulties, Fredericksburg remained a strategic location. Even as a local company struggled to construct a railroad to the west, the north-south land link between Richmond and Washington D.C. was greatly improved by the Richmond, Fredericksburg and Potomac Railroad. Railroad development, however, had unfortunate consequences during the Civil War. Large, industrial-era armies, with their tremendous logistics needs, were inevitably drawn to the rail corridor that could keep them supplied. On four separate occasions, the Union Army of the Potomac fought the Confederate Army of Northern Virginia in and around the City. In their wake were strewn over 100,000 casualties, shattered buildings, a scarred landscape, and a wrecked economy. Commercial activity in Fredericksburg had begun to decline before the Civil War and the post-war period was not especially prosperous ether. Not until 1872, for example, was the railroad completed between the City and Washington, D.C. Even so, local industry continued to function along the waterways and around the railroad station. 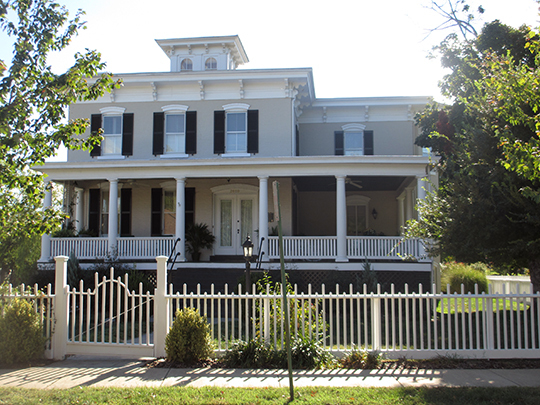 There were future benefits in this ordeal because the slow economic growth resulted in a large number of Fredericksburg's historic structures remaining intact. The retention of so many original buildings helped the City to develop an image as a community rich in American history. As the City progressed into the twentieth century, this historic ambiance generated economic activity through tourism. The potential for visitation also grew out of the area's Civil War experience. During the latter part of the nineteenth century, increasing numbers of veterans arrived in Fredericksburg to visit scenes of their past struggles. They worked hard to get the Federal government to purchase significant portions of this historic terrain, and the Fredericksburg and Spotsylvania National Military Park was established in 1927. The battlefield park, now administered by the National Park Service, continues to draw visitors to Fredericksburg. During the post World War Two economic boom, that lasted nearly 50 years, suburban growth exploded from Washington D.C., to the counties of Stafford and Spotsylvania. The implications to the Fredericksburg area are enormous because publicly funded highways (Route 1 Bypass and Interstate-95) have shifted Fredericksburg's traditional commercial base to new locations. The City has responded by annexing areas where the new routes cross the old ones. The new transportation patterns serve suburban needs, but the central business district still maintains its viability by drawing business and residents to its traditional and historic setting. The Fredericksburg Historic District was listed on the National Register of Historic Places in 1971. Selected text, below, was transcribed from a copy of the original nomination document. With a history dating back to the seventeenth century, Fredericksburg has maintained a distinguished position in the annals of the Commonwealth. Established in 1671 when a group of colonists settled on a piece of land just below the falls of the Rappahannock River, the town gradually grew into a prosperous community. In 1727 the town was officially chartered by the House of Burgesses and named Fredericksburg in honor of Frederick, Prince of Wales and eldest son of George II. Five years later Colonel William Byrd visited there and reported that "Though this be a commodious and beautiful situation for a town, with the advantages of a navigable river ... yet the inhabitants are very few." He mentioned seeing "the public warehouse which is built on the figure of a cross" and the stone prison. In 1748 with the establishment of a ferry across the Rappahannock the town began to evolve into an important trading center. During the Revolution many of the leading Virginia patriots were associated with the town.. Colonel Fielding Lewis, brother-in-law of George Washington lived there in Kenmore with his mother-in-law, Mary Ball Washington, living on a neighboring street. Other leaders included General William Woodford, General Hugh Mercer, Lieutenant Colonel James Monroe and Major Thomas Marshall. Although suffering three disastrous fires in the early-nineteenth century, Fredericksburg continued to grow and became an important commercial center in antebellum Virginia. By 1840 the town boasted 3,974 inhabitants and seventy-three stores, one grist mill, two tanneries, five academies, seven schools and four semi-weekly newspapers. In spite of many modern encroachments, Fredericksburg retains an important assemblage of eighteenth and nineteenth century buildings. With its historical associations and representative architecture the town remains a relatively undisturbed historic community that would greatly benefit by a systematic and thorough restoration and renovation program. City of Fredericksburg, Comprehensive Plan, 1999. Virginia Historic Landmarks Commission Staff, Fredericksburg Historic District, 1971, National Park Service, National Register of Historic Places, Nomination Document, Washington, D.C.